FERGUSON, Mo. (CNS) — These days, Sister Cathy Doherty, a School Sister of Notre Dame, devotes most of her energy to promoting interracial friendships between students in the St. Louis-area parochial schools. It’s not what she ever imagined she’d be doing, but, as Proverbs says, God’s purpose tends to prevail over our best-laid plans. Nearly every surface of Sister Doherty’s office is covered by an image, candle or figurine depicting Our Lady of Guadalupe, the namesake of the parish in Ferguson, Missouri, where she has served as pastoral associate for nearly three decades. Here, she explains how the events of Aug. 9, 2014, upended everything she thought she understood what God had called her to. “My life totally changed when Michael Brown died,” she told Global Sisters Report. Before “the Ferguson incident,” as she calls it, Sister Doherty’s whole world had been liturgy: Her master’s degree is in liturgy, she had chaired the St. Louis liturgical commission, and she was in charge of the St. Louis Archdiocese’s annual liturgy camp for high school students. But after Darren Wilson, a white police officer, fatally shot Brown, a black 18-year-old, just three miles from Our Lady of Guadalupe Church and then faced no charges, it seemed inappropriate to focus on ritual at the expense of racial injustice, Sister Doherty said. Sister Doherty’s hallmark program is made up of second-, fourth- and seventh-graders from three schools: the mostly black and Hispanic Our Lady of Guadalupe and the mostly white Incarnate Word and St. Cletus. The first year of the program, students visited each other’s schools to learn Catholic social teaching. The second year, Sister Doherty zeroed in on the idea of culture by having students make family trees and research Marian apparitions from around the world. “If we start when they’re little, hopefully, when they’re adults, they won’t have racism,” she said with a thin smile. In the four years since Brown’s death, dismantling racism — at both the personal and systemic levels — has become an integral part of the St. Louis Archdiocese’s official mission. Eleven days after Brown was shot, Archbishop Robert J. Carlson announced he was reviving the 1963 Human Rights Commission — renamed the Peace and Justice Commission — in an effort to better facilitate the Catholic response to the public grief and outrage. Three women religious, Sister Doherty among them, were named to the 27-member commission. Its director, Marie Kenyon, said that to understand how local sisters have been galvanized against racism, you have to look at the way they’ve transformed their ministries. For example, Kenyon said, a sister artist opened a gallery featuring a painting of a black Christ; a sister educator spearheaded a diversity and inclusion training for the principals of all the parochial schools; and a sister community organizer set up interfaith conversations on race in nearby St. Charles County. Of course, anti-black racism in Ferguson didn’t begin in 2014. St. Louis is the 10th most segregated city in the nation and the U.S. Department of Justice’s investigation of Ferguson’s mostly white police force found a “long history” of officers singling out black residents for degrading and unconstitutional treatment. But what Brown’s death and the subsequent protests forced many white people in the St. Louis area to wrestle with was the luxury they had of assuming things weren’t that bad. 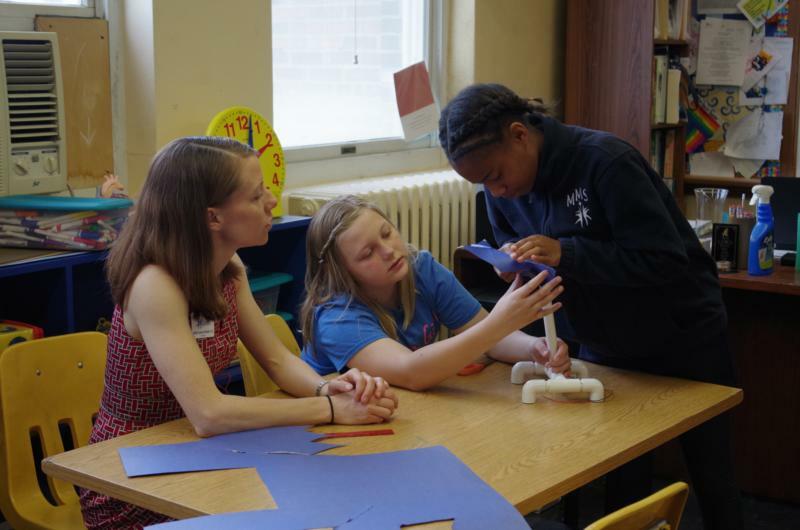 To illustrate how her consciousness has expanded, Sister Sarah Heger, a Sister of St. Joseph of Carondelet and principal of Marian Middle School, a Catholic school in St. Louis for low-income, high-achieving girls, tells the story of the day a police car came through the parking lot. For the last year or so, Sister Heger has been participating in the near-daily protests in and around Ferguson. “Protest” is a loose term, she said. There’s the typical marching in the street, but sometimes “protesting” means going door-to-door for a voter-registration drive or attending a town hall meeting as a bloc. Not much has changed in Ferguson, said Adolphus Pruitt II, president of the St. Louis NAACP. “While there’s been a significant amount of attention to what’s going on in Ferguson, that has not necessarily created a return investment,” he explained, adding that adverse indexes for housing, health and education for black people have barely budged in the last four years. Still, Sister Heger is optimistic. She said she’s not naive enough to think that undoing generations of racial inequality will happen overnight. Not only do racist thoughts and opinions have to change, but racist systems need to be dismantled and rebuilt in ways that are fair and equitable — all of which takes time, she said. But things are happening, and that’s progress. For example, St. Louis County residents on Aug. 7 voted out of office Robert McCulloch, the prosecuting attorney many say protected Wilson; he had held the office for 28 years. Replacing him will be Wesley Bell, a black city councilman from Ferguson with a history of advocating for reforms in the criminal justice system. For her part, Sister Doherty said she believes the movement toward justice will prevail because it has heavenly protection. She’s seen the signs. Our Lady of Guadalupe Parish was scheduled to have its annual Hispanic festival eight days after the shooting, she said. They didn’t want to cancel the event because they wanted to show the community they were not afraid to be out on the streets. Sister Doherty convinced Bishop Edward M. Rice, then a St. Louis auxiliary and now head of the Diocese of Springfield-Cape Girardeau, to clear his schedule so he could celebrate the opening Mass as a sign of solidarity. After the Mass, the two of them went to the spot where Brown died. About 300 people were already gathered there, most of them holding roses — a sign of peace, but also the sign of Our Lady of Guadalupe. Then, when they made it up to the front, a collection of Our Lady of Guadalupe candles sat alongside where Brown’s body had lain in the middle of the street for four hours. Sister Doherty said Bishop Rice asked her if she was afraid of the crowd. Araujo-Hawkins is Global Sisters Report staff writer.